… as was suggested by one of my ‘ardent’ followers of the blog! No, things have not been very conducive to blogging in the last week, in fact, there has been so much turmoil around the house and around some of the bike parts (or rather their origin and what is going to happen to them, that I have neither had the time or the energy to devote to the bike or the blog at all. This is now slowly sorting itself out and I shall definitely be continuing this weekend, when at least some of my issues here will have either sorted themselves out, or will have been sorted by me (if you get the difference!). I am still trying to source someone who is adept at, and still offers, STOVE ENAMELLING as a service to the public. Failing that, I shall have to rely on finding someone to blast and wet-paint (2-pack) the frame and forks (which are actually still together) plus any other bits that I can muster together. I still haven’t decided whether I am going to have chrome, alloy or black rims and/or spokes (not really interested whether it is ‘original’ for that year or not) I quite like the idea of black hubs and rims with chrome or stainless spokes! Might look a bit strange, will have to work that one out. Any ideas?? What I still will have to get hold of are: mudguards front and back, mudguard stays of course, make a final decision about the petrol-tank, the battery holder, brake pedal and rod and fix up the chain-case outer. The dynamo-belt cover needs repairing and so will be done wit the final lot. That sums up the cycle-parts to be painted, some of the gearbox- and engine-parts will need paint, too, but those will be done along with the last of the cycle-parts. The engine and gearbox? Well, that’s another story altogether! Still not sure what to keep and what to sell, what actually may have to go back or be repaired and what I can keep. I can keep all the parts from the first engine (but not use them all)…what I can use is the whole of the bottom-end (new main bearings will be needed and I still have to test the oil-pump). The piston and barrel seem fine, as does the small-end. The cylinder-head casting is great, the valves and seats will have to be replaced with lead-free-capable items, the upper cam-drive-bevel bush will need replacing and I’ll need a handful of shims and advice to get that together properly, the cam itself will need replacing and the rockers will need re-facing and grinding at both ends. Springs are full length and seem fit and healthy, though maybe I should change the whole lot. Most annoying is that I will need every single oil pipe, feed and connection, all the filters etc, too, plus all nuts, bolts, studs, screws and fittings for the whole gearbox and engine. All sprockets and chains, of course, too. A lot of clutch parts are missing, but I can complete that without too much trouble and one working gearbox is easily possible (after renewing the bearings…and sorting out the quadrant!). 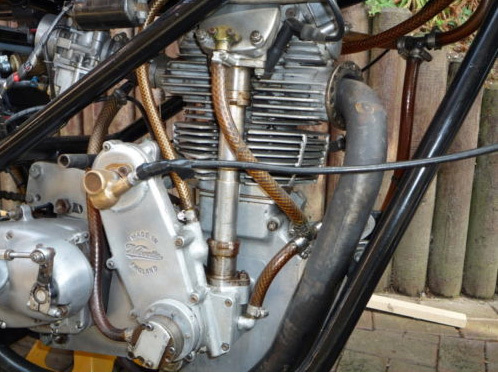 Electrics will be kept simple, I always like to have a Chronometric speedo, rev-counter, oil temperature and pressure gauge (I have a lovely vintage one that reads to 10 psi), ammeter is not absolutely necessary. The headlamp will be prefocus high/dip single-filament HID, which are conveniently and easily fitted and are perfectly hidden (until they are turned, on, of course!) The colour of the beam is not that gruesome 5000°K bluish-tinge, which at night has the problem that everything in the beam seems monochrome, bleached of all colour. No, these I have specially made with the ‘pale straw’ colour of the Lucas pre-focus filaments, just a hell of a lot brighter! If anyone should be interested, I can get 35W, 12 volt kits for around AU$100 each, which are simple plug-and-play. All they need is a + and minus, and a 3-pin halogen bulb-socket. no other wiring has to be changed. OK, so you don’t yet have the halogen socket on the loom or physically on your 8-inch headlamp reflector. I am working on getting these modified or made, as I feel that 6v or 12 Halogens (available in 35W) are the very minimum in today’s traffic, even if daylight running with lights is not compulsory…it is definitely safer, whether we like it or not. The electrical bulb (globe) socket is easily wired up if you don’t already have one. I shall be doing a blog on how to do the conversion properly at a later stage anyway, so I’ll keep you all posted! The picture at the top?? ‘Tis is off eBay, one of the KSS ‘race’ bikes on sale a month or so ago… looked very purposeful and business-like, I thought, don’t you think so, too?